Preheat 2 teaspoons each of peanut and sesame oil in a 12-inch (high-sided) skillet. Turn heat to medium and add onion, bell pepper and carrot. Sauté for 4 to 5 minutes (stirring occasionally) until vegetables begin to soften. Add ginger and garlic, stir for an additional minute; pour into bowl. Return skillet to medium-high heat and add remaining teaspoon peanut oil with ground pork and seasoning. Fry pork, breaking up all lumps with a wooden spoon, until no longer pink (4 to 6 minutes). Add vegetables to skillet along with remaining ingredients, with the exception of green onions and rolls. Stir everything together, then decrease heat to low. Cover and simmer for 20 minutes, stirring occasionally. Warm Kaiser rolls in oven and place onto 6 plates. 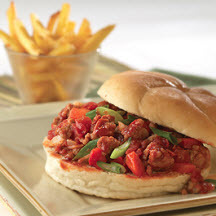 Divide Asian Sloppy Joes between the 6 sandwiches and sprinkle with green onion. *Visit www.alpinetouch.com to purchase Alpine® Touch All-Purpose Seasoning, or substitute 1 teaspoon onion salt, plus 1/8 teaspoon garlic-pepper blend for the 1 teaspoon Alpine® Touch All-Purpose Seasoning.